Skewer grapes onto each straw from end to end, alternating colors. Serve with Honey Peanut Butter Dip. 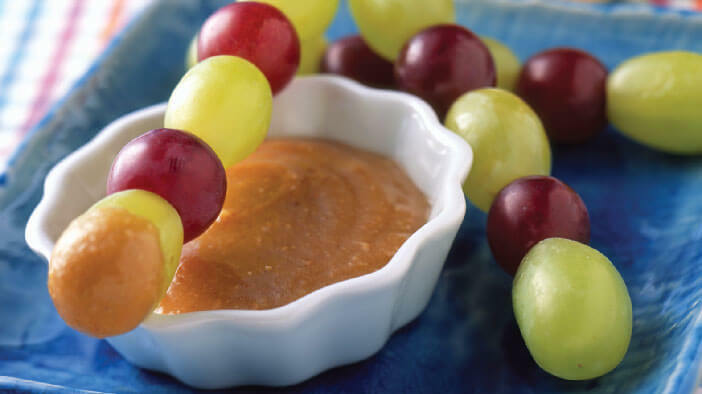 Honey Peanut Butter Dip: Whisk ingredients together until smooth. Portion into 1 oz. servings to accompany skewers. Nutritional analysis per serving: Calories 187; Protein 5 g; Carbohydrate 37 g; Fat 6 g; 25% Calories from Fat; Sat Fat 1 g (4% Sat Fat); Cholesterol 0 mg; Sodium 99 mg; Fiber 2 g.